Lamb & Rice Kibble is a wholesome and natural hypo-allergenic dog food for loose bowels and for calming itchy and irritated skin and coat. The traditional flavour all dogs enjoy as part of a balance diet, especially when it comes to helping digestion and avoiding skin irritation. Barely is a great source of fibre and is added with seaweed, alfalfa and yucca to provide that all round goodness. Recommended for dogs over 7 years old. Brown rice (26.9%), lamb meal (19.1%), barley, white rice (18.6%), whole linseed, lamb gravy (2.9%), sugar beet pulp, lamb fat (2.4%), alfalfa meal, omega oil supplement*, seaweed (0.5%), potassium chloride, sodium chloride, parsley (0125%),nettles (0.125%), taurine (0.1%), chicory extract (0.1%), calcium carbonate, glucosamine (0.045%),yucca extract (0.02%), chondroitin (0.005%). Antioxidants - E306/Natural antioxidant: 191 mg, Vitamins - E672/Vitamin A: 15000 iu,E671/Vitamin D3: 1400 iu, Trace elements - E1/iron: 133 mg, E2/iodine: 3.3 mg, E4/copper: 20 mg, E5/manganese: 40 mg, E6/zinc: 385 mg, E8/selenium: 0.44 mg. Protein 18.5 %, crude fibres 3.5 %, fat content 9.2 %, crude ash 7.8 %, Vitamin E 400 mg/kg, omega-3 fatty acids 1 %, omega-6 fatty acids 1.3 %. Additives per kg: antioxidants: E306/Natural antioxidant. 187 mg, Vitamins: E672/Vitamin A, 15000 iu,E671/Vitamin D3, 1400 iu, Trace elements: E1/iron, 133 mg E2/iodine, 3.3 mg, E4/copper, 20 mg E5/manganese, 40 mg, E6/zinc, 385 mg, E8/selenium, 0.44 mg. The recommended daily serving is only a guide as requirements vary considerably from dog to dog. The daily serving should be adjusted according to the body condition of your dog. Feed in one meal per day or ideally divide into two meals per day. The food is designed to be fed dry but may be moistened with warm water to bring out the flavour. Supply plenty of clean, fresh drinking water at all times. If using James Wellbeloved moist pouches as a tasty topper, reduce dry food by 40g for every 150g pouch fed. We recommend that feeding is supervised. 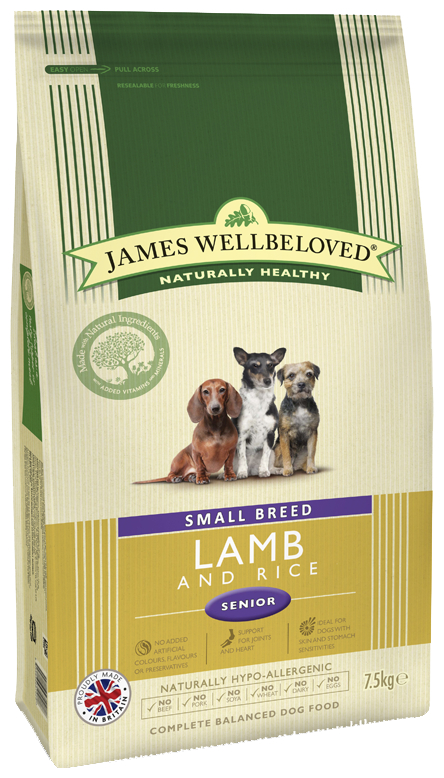 There are currently no questions for James Wellbeloved Senior Lamb & Rice Dog Food - be the first to ask one!